Discover the joy in paint pouring! Explore a variety of new techniques and leave with multiple paintings and inspired to create more. All materials, paints and mediums are provided. Students will move through a series of exercises to learn the best way to mix and combine colors, different approaches to paint application, creating a variety of designs and how to ensure successful results every time. If you haven’t tried abstracts before, this is a great introduction and will help develop a unique voice in your paintings. 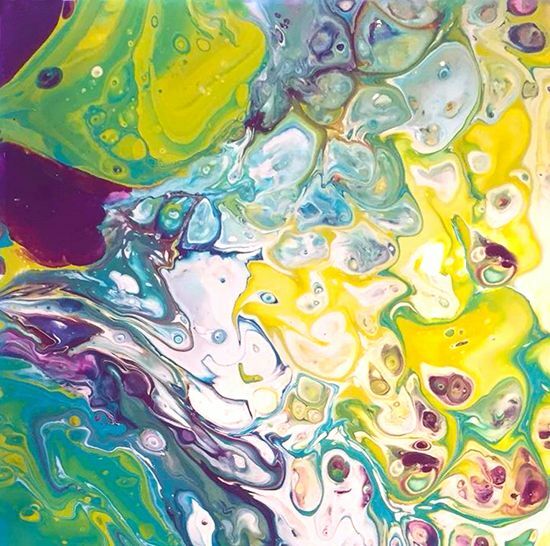 If you’re already experienced with abstracts, you’ll love this new technique to add to your toolkit. Bring an apron, gloves and some paper towels because it can get messy. Relax and let loose in this informative, encouraging and fun environment! Workshop includes paints, mediums, cups, sticks, 2 panels to paint on, and an instructional booklet to take home.